The origin of the mouse coordinate system is in the top left corner of the viewport, so mouse coordinates are always positive integers. In the picture, the current mouse coordinates are (147,105), and these are the same values that are contained in the mouse events that the GEF lightweight system receives and dispatches to figures and tools. In GEF3D however, these coordinates are handled a bit differently in order to allow seamless integration of embedded 2D editors (see below. 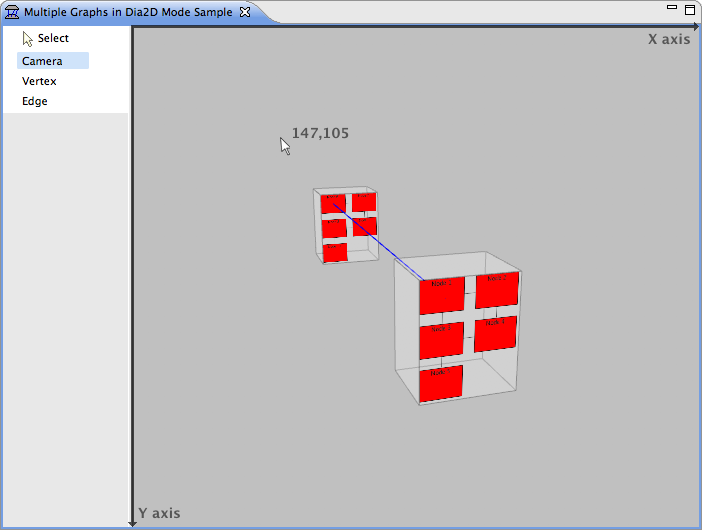 When a GEF 2D editor is embedded in GEF3D, its content figure is added to a 3D host figure, usually a cuboid shape. The 2D figures are drawn on the front face of the cuboid, which we will call drawing surface. Since an embedded GEF editor cannot handle 3D coordinates, it must be supplied virtual surface 2D coordinates. This surface coordinate system has its origin in the upper left corner of the drawing surface and the surface coordinates are integers which may be negative. The first method is a convenience method which takes a point with surface coordinates and the second method takes two integer coordinates.